Please add the official company data to your inquiry. Calculations for any other mounting situations on demand. 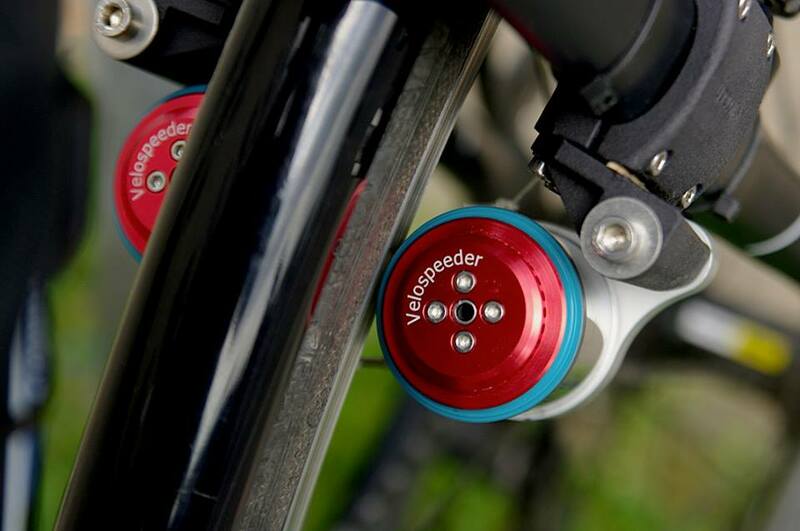 We plan the distribution of the Velospeeder motor in the U.S. based on authorized dealers with workshop. Potential buyers may contact us to get more information. The assessing of the feasibility for a VELOSPEEDER installation on a concrete bicycle is done by VELOGICAL, details in direct communication with the customer. On request, we recommend selected brandnew bicycle models, also offered by high quality so-called "White Label" suppliers, which can be designed with our VELOGICAL logo. 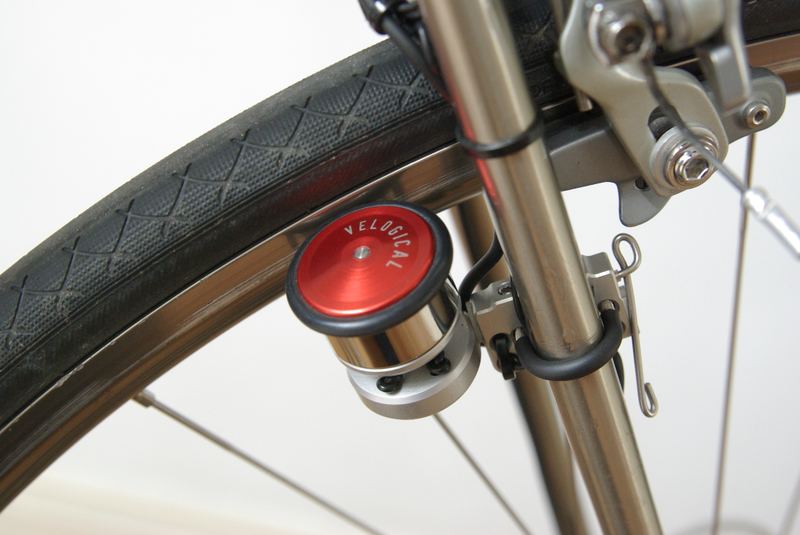 The VELOSPEEDER is the only friction drive for bicycles with dynamic auto-regulation of the contact pressure. At any riding speed it finds the optimum contact pressure by itself. In the wet this pedal assist motor does not slip through. When not in use it can be folded-off completely. The maintenance-free interval for this energy-efficient light e-bike drive is higher than expected previously. A replacement of the friction rings is necessary after 7.000-10.000 kilometers (4500-6000 miles) only. Apart from the friction rings, the other engine components are largely free of maintenance. Increased abrasion of the rim flank due to the use of this material sparing engine concept could not yet be determined. Rental fee € 30 / day, € 60 / WE (Fri-Sun), deposit € 100. Rental fees can be offset with a purchase of the rental vehicle. The rental time period will be calculated based on the opening hours at the Velogical headquarters (Mon-Fri 10-18 Clock). Tours suggestions between the Rhine Valley and the surrounding uplands are configurable as desired. Tandem pilots for handicapped co-pilots are selected and they will manage their job well. Body measurements for 2 drivers, arm lengths in cm (shoulder to wrist back)! Overall body size indicate in cm! so that we have a chance to contact you in return. Or download the above interactive order form for consumers (B2C). € 126,05 plus local taxes/shipping/PP. Please contact us accompanied by your B2B identity data. to the riding direction is critical." "Frame stay adaptor middle 20/32"
Specify left or right mounting assembly! Please clarify installation situation feasibility with us. Our prices are final prices for the German market inclusive of VAT (19%) and exclude shipping costs. We also accept international orders, but to advance the full invoice amount. For international inquiries we create customized offers, which take into account different rules in sales taxes correctly. For our customers, we like to take our time. As a manufacturer of handmade quality products, we offer clients by appointment at our headquarters in Cologne, including test drive. For information according first examples of our preconfigured coherent design concept you may visit our website. In all of these concerns, we are happy to advise you professionally and personally. After your order accepting our terms and conditions you will receive an order confirmation with all the details discussed. We are interested in long-term relationships based on mutual fairness and transparency. Our terms and conditions are aviable online, have a look below on this page. Our frame builder Stefano Agresti has a voluntarily extended warranty of 10 years on the tandem frame for the original owner covering manufacturing defects (break) from date of purchase when used properly. Excluded from this warranty is damage due to voluntary mechanical damage or during races. Our tandems are made in small batches to very high quality standards. In addition to technical perfection, we focus particularly on the needs of physics at the intelligent design of a hi-tech tandems even in inconspicuous but important details, such as increasing demands from the utilization of the materials and components used in tandems. Parts that come into consideration for a warranty, please send without any intervention in a shipping free of fees at VELOGICAL. If warranted, we will refund you in hindsight of course the shipping costs within Germany. Obvious transport damage must be reported to us immediately at receipt of goods, concealed damage within 5 days in writing. The statutory warranty periods, the general legal rules of warranty for defective items for non-merchants (2 years) or for merchants (depending on the type of customer) and the supplementary conditions of the manufacturer. All warranties relating to the first error that occurred. Consequential damages and claims for damages, including personal injury, are expressly excluded. The use in races is done at your own risk. The customer is responsible by himself for a reasonable, secure use of the material and for a regular maintenance on his own for a proper function. Your personal data of which we become aware will be kept strictly confidential. Disclosure to third parties is expressly exclude. However, you know that we store and process your information for our own purposes. radforum Felgendynamo, Nabendynamo oder Akku? 1 The following delivery terms and conditions (hereinafter Terms and Conditions) shall apply exclusively to all business relationships, offers, deliveries, sales and service transactions between the VELOGICAL engineering GmbH and the purchasers of its goods, services and offers. Conflicting terms and conditions of the Purchaser are hereby rejected. 2 They are regarded as agreed upon acceptance of delivery or service or offer of VELOGICAL engineering or order by the customer at the VELOGICAL engineering GmbH, at the latest with the acceptance of the delivery. 2 For traders and legal persons of public law or public special fund under these Terms and Conditions also apply to all future business relations, even if they are not expressly agreed again, unless alternative arrangements are made explicitly. These conditions deviating agreements or additions, telephone and verbal agreements are only binding if they are confirmed in writing by the VELOGICAL engineering GmbH. 3 If the customer does not accept the Terms, this must be declared within three working days. 4 If any part of the following conditions be ineffective, the validity of the remaining provisions shall not be affected. 1 In brochures, advertisements etc. u contained information about the delivery of the program VELOGICAL engineering GmbH are non-binding. 2 Specified within the contract terms and descriptions of the goods provide the technical status at the time dar. design changes for deliveries under this contract, the VELOGICAL engineering GmbH expressly reserves the right, if these changes are not of a fundamental nature and the contractual purpose is not significantly restricted. Models, drawings, descriptions, price lists and quotations remain the property of VELOGICAL engineering GmbH and may not be reproduced or her written consent to third parties. The VELOGICAL engineering GmbH reserves the right to change prices reasonable, if occurring after the conclusion of the contract, cost reductions or increases, especially due to collective agreements or material price changes. These are proven to the purchaser on request. Is the installation of equipment or parts included in the contract, the plant is removed from the customer after installation and commissioning. To an acceptance report shall be prepared which shall be signed by the purchaser. 1 After ordering an advance invoice is created. After payment of the advance invoice the ordered goods are delivered. 2 The payments shall be made without any deduction for the free VELOGICAL engineering GmbH. 3 It is the current price list when ordering. The prices include the applicable VAT and plus shipping costs. In tandem orders, the customer has the choice between Selbstanholung and shipping. Dynamo Orders are generally shipped. 4 Is a production supplied in parts, so the corresponding part payment corresponding delivery is due. The VELOGICAL engineering GmbH is entitled to demand advance payments from production orders according to the performance of the production. 5 A set-off or the exercise of the retention is permitted only with undisputed or legally established claims of the customer. Also allowed the set-off is disputed but on which a decision counterclaims. Subject to any other agreement delivery (exw) agreed. 1 The risk shall pass to the dispatch of the goods to the customer about, even if partial deliveries are made or the engineering GmbH VELOGICAL other services, such as the shipping costs or delivery has taken over the goods. 2 If delivery is delayed due to circumstances for which the VELOGICAL engineering GmbH is not responsible, the risk shall pass to the customer on the day of dispatch. 3 If the customer's obligation to collect or acceptance of the goods in default or he gets notified ready goods within the agreed period from the VELOGICAL engineering GmbH is entitled to store the goods at the buyer's risk in its reasonable discretion and as provided in invoice provide. If the customer is in default of acceptance, or the collection of retrieval, the risk of accidental loss or accidental deterioration of the goods passes to him. In addition, the VELOGICAL engineering GmbH in these cases a claim for payment of a contractual penalty in the amount of 1% of the value per commenced month of the incurred delay, but not exceeding 10% of the value, as well as damages in the amount of actual and verifiable costs of storage. 4 If the customer notified ready goods, not from or fails to retrieve within the agreed period, the VELOGICAL engineering GmbH is also entitled to put the customer for making his participation action a reasonable deadline to withdraw after the unsuccessful expiry of this period of the contract and a the performance of the VELOGICAL engineering GmbH to request relevant part of the remuneration. The legal conditions for the acceptance shall remain unaffected. If the customer is a private final consumer and not a commercial customer or entrepreneur, he has the right to cancel his contract within two weeks without notice. In case of an effective cancellation, the services received by both parties shall be granted back. give it back in deteriorated condition, he must pay compensation for the value. This does not apply if the deterioration of the goods is solely caused due to their inspection. - As it would have been possible for the customer in a retail shop, for example. not using the item as an owner and avoiding everything reducing the value. Items that can be sent as parcels are to be returned. tailored to the personal needs are not suitable for a return shipment. 1 Parts that come into consideration for a warranty, please without any intervention in a free show at VELOGICAL ver-send. If warranted, we will refund you in hindsight of course the shipping costs within Germany. Obvious transport damage must be reported to us immediately at receipt of goods, concealed damage within 5 days in writing. The statutory warranty periods, the general legal rules of warranty for defective items for non-merchants (2 years) or for merchants (depending on the type of customer) and the supplementary conditions of the manufacturer. All warranties relating to the first error that occurred. Consequential damages and claims for damages, including personal injury, are expressly excluded. We reserve the right to rectify deficiencies. The right to reduce the remuneration is not the case that the value or the suitability of the work is only insignificantly decreased. As of the date of delivery of the ordered goods or services the customer is even concern for a reasonable, secure use of the material and, through careful and regular maintenance of their own responsibility for proper function. 2 The VELOGICAL engineering GmbH assumes no liability for defects caused by wear and tear, incorrect or negligent handling, improper storage, improper use or failure to observe the processing and usage instructions, improper equipment, replacement materials, faulty assembly, improper use context, chemical chemical, electrochemical or electrical influences. 3 The warranty and liability is excluded if the customer continues to take the poor thing into knowledge of a defect in service, installs, processed or sold. 4 Shows a lack of the customer, he has to give the VELOGICAL engineering GmbH immediate opportunity to examine the defect, in particular to provide the defective goods available to send them at the request of the VELOGICAL VELOGICAL or to grant access to the defective goods. If and to the extent the customer complaint is justified, the VELOGICAL engineering GmbH is obliged to bear the costs incurred by the customer for the delivery of the defective goods. The reimbursement is limited to insured shipping at the value of the goods without express surcharges. 5 If the Purchaser terminates the contract, he shall not be entitled to claim damages due to the defect, provided the VELOGICAL engineering GmbH is not responsible for the lack of willful misconduct or gross negligence. If only a part of the delivery is defective, the buyer can only withdraw from the entire contract if he has no interest in the rest of the delivery and service. If the customer chooses compensation, the goods shall remain with him if this is reasonable. The compensation is limited to the difference between the purchase price and the value of the defective goods, provided that the VELOGICAL engineering GmbH is not responsible for the breach of contract for fraud. The buyer's claims for defects and other claims are subject to a limitation period of one year. 6. 20% of the purchase price for custom-made, frame-specific bicycle components for e-bike drive sets are retained in case of exchanging for goodwill or in case of cancellation after order placement. 2 If the reserved goods are resold, sold alone or together with the VELOGICAL engineering GmbH belonging goods, the buyer shall already arising from the resale to the extent of the value of the reserved goods with all ancillary rights and priority over the rest of the VELOGICAL engineering GmbH. The VELOGICAL engineering GmbH accepts the assignment. Assigned to him by the customer receivables related to the accepted balance and in the event of insolvency of the third party to which existing causal balance. The value of the goods is the invoice amount including VAT. Is the resold goods / goods in the ownership of VELOGICAL engineering GmbH, then the assignment of the claim extends to the amount equal to their share of the property value. The same applies to the extended retention of title. 3 If the reserved goods are installed as an integral part of the property of a third party by the purchaser, the purchaser hereby assigns to the against the third party or against whom it may concern, resulting claim for compensation to the value of the reserved goods with all ancillary rights, including those of a provision of securing mortgage with priority over the rest of the VELOGICAL engineering GmbH from. The VELOGICAL engineering GmbH accepts the assignment. 4 If the reserved goods are installed as an integral part of the property of the Purchaser the Purchaser, the Purchaser already now assigns the trade even from the sale of the goods or arising therefrom claims up to the value of the goods with all rights and priority over the rest of the VELOGICAL engineering GmbH from. The VELOGICAL engineering GmbH accepts the assignment. 5 Any execution in the reserved goods, the purchaser of the VELOGICAL engineering GmbH shall immediately inform and hand over the necessary documents for an intervention. This also applies to impairments of any kind, the costs of extrajudicial efforts to release and return procurement by the purchaser. This also applies to the cost of a legitimate judicial intervention if it can not be recovered from the third party. 6 With payments and / or application for opening of insolvency proceedings, the right to resell, use or installation of the goods or the authorization to collect the assigned receivables will also. When a check or bill protest the debit authorization does not go out for the rights of insolvency law. 1 The purchaser agrees that the VELOGICAL engineering GmbH processed received in connection with the business relationship data concerning the Customer in accordance with the Federal Data Protection Act for the performance of their own business purposes. This also includes the storage or transmission to a credit protection organization, provided this is done in the context of the purpose of the contract or is necessary to protect their legitimate interests and no reason to believe that the legitimate interest of the Purchaser to the exclusion of the processing, in particular the transmission, this data is predominant. 3 The exclusive place of jurisdiction for all disputes and exchange and checks is the seat of VELOGICAL engineering GmbH Jan-Wellern-Straße 23 D-51065 Köln-Mülheim, the VELOGICAL engineering GmbH Jan-Wellern-Straße 23 D-51065 Köln-Mülheim, however, is entitled , the general jurisdiction of the buyer to take legal action. 4 This Agreement is governed exclusively by the laws of the Federal Republic of Germany under exclusion of the UN Sales Convention (CISG). 5 Business language is German, and English by prior arrangement. 6 The VELOGICAL engineering GmbH stores data of the customer in compliance with the Data Protection Act.